As a bride you will probably receive several different timelines; one from your wedding planning book, one from a wedding planner and even more from guides and magazines. It is easy to get wedding timeline overload. The important thing to remember is that these timelines are not meant to be strickly followed. The idea is to give you a guide in planning your wedding. It is to get you thinking about certain items on your to do list at a certain time. For example, you are probably not going to get your favorite venue one month before your wedding, so many timelines put this in the 12 month section. It is to get you to think about where you want your wedding and to help make sure you can get it. Your wedding dress will probably take 4-6 and a month for alteraltion, so a timeline might put “buy wedding dress” in the 9 month section. This gives you enough time to be a picky as you want and still have time to get it in and altered. Some items can be time sensitive so timelines have been created to help you think about items early so you do not miss out on what you want. On the other hand, if the timeline you are using tells you not to get a baker until 5 months but you find someone you really like at 9 months, book them. You do not need to wait until 5 months and you do have a chance that they are booked for your wedding date. Besides, if you get this done early, you can check something off ahead of schedule. Again, the timeline is a guide not the law and is there to make sure that you are on the right path. It is important to read your timeline for your current month to make sure nothing big has been missed. It is also important to read ahead. Maybe something coming up in two months can be taken care of now. You will find as you get closer to your wedding day more things will seem to be not done, so if you can get something done early it will probably help you in the long run. Who is that guy at the end of the aisle in the tux? A wedding is a joyous event that brings to people together in marriage. Too many times, however, the wedding planning process is about just the bride. I have heard countless times the “its all about me” phrase and wondered, what about the groom? I have seen it where the groom is completely left out the planning process. This can be what the groom wants, but many times they wanted to feel included. Even the grooms that does not really care what flower is on the tables, may care about what songs are played during the ceremony or what he is wearing. It is important to remember that this is a wedding for both a bride and a groom. As you are planning your wedding, try to include your groom when you can. You do not need to bombard him with ever aspect of the wedding (unless of course he wants that) but do try to make him feel included. If you can figure out what he wants the day to be like, then you can both have a great experience. As a couple you should sit down at the beginning of the planning process, and figure out what you want the wedding to feel like. You may want a pretty pink Cinderella wedding, but he may not want to be in a pink overload. If you do not talk about it, he may not tell you in order to avoid a fight. You could compromise and add green into the mix to tone down the pink. He will probably like the manlier color, and you still get your pink. Maybe he loves M&Ms, you could use these as your favors. This would easily incorporate him into the wedding. Your wedding is about the both of you and will be a better experience if you share this wonderful journey together. Merry Christmas! I hope you all have a wonderful holiday and a Happy New Year! One of the problems that most couples face is the growing budget. Everyone wants every detail to be perfect and sometimes the price gets lost. Here is a cost saving tip. Plan ahead and try to purchase decor items at the end of a season. For example, if you are having a winter wedding next year, go out after Christmas this year and look for items for your wedding. Even if you are not doing a Christmas wedding, you can probably find items that will fit your scheme. I was at the store yesterday and saw a cone tree shape made out of round ornaments in silver or gold. It was a beautiful arrangement that did not have to be just Christmas related and it was already on sale. 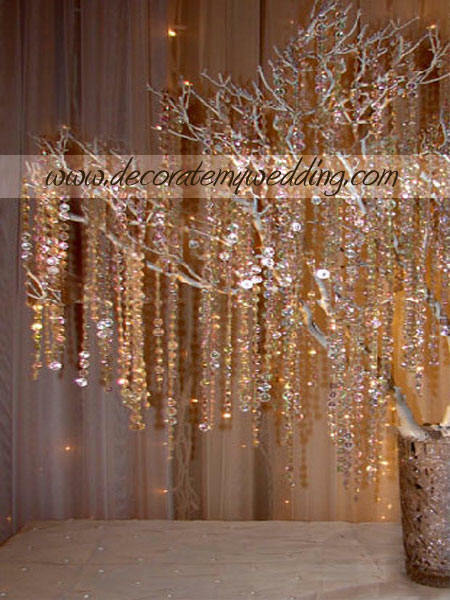 This could easily be placed in your ceremony or reception decor. This budget saving idea can also work for spring, summer and fall. If you take the time early to look for and decide on some decor ideas, you will come out ahead. This will help you save money for when you need a little extra for that perfect wedding dress. One of the new trends in wedding colors is the combination of grey and yellow. I think that this is a great combination that can be used by many different brides. Here are two examples of using the same color combination depending on the type of bride you are. If you are a more classic bride and are having a spring wedding, you could have the girls in yellow chiffon dresses with gray trim holding white roses. The invitations could have a soft yellow scroll pattern and you could be surrounded by yellow and white roses in silver vases on your tables. Maybe you are a more modern bride. This color scheme can work also work for you. Your bridesmaids could be in grey dresses and holding bright yellow flowers. You invitations could be a modern pattern in grey and yellow. Your tables could have yellow flowers in white vases on grey tablecloths. Either way you would have a fabulous wedding color scheme. Also for each I would mix it up and have the men where grey tuxedos. For the classic spring wedding it would make the men look softer, and the modern wedding would give a touch of the unexpected. This is a great color combo that I think anyone would enjoy. We have all been to weddings with a store purchased bow hooked to the end of the pew for the ceremony. While this is an ok idea, it is not unusual or special. If you are having a fall wedding and would like something different, I may have just the thing. 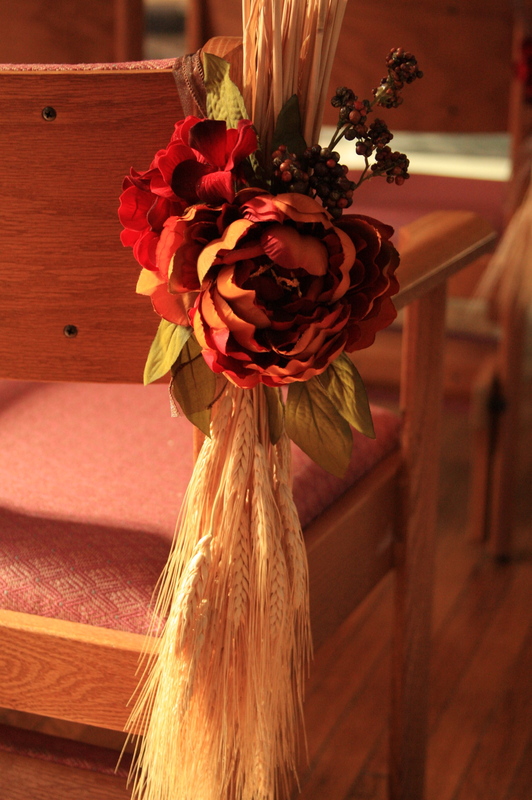 I recently had an October wedding where the bride wanted fall themed pew decorations. She really wanted to incorporate wheat somewhere in her wedding decor, so I came up with this idea. We used wheat handing downward with one large flower, small bunch of hydrangeas, and some berries. Since the pews that we were hanging them on had raised corners, we used ribbon to hang them over the edge. They turned out perfectly and looked great down the aisle. This was a great way to bring the fall theme into the church. Below are a couple great shots that help show the great effect of these decorations. One of the problems brides sometimes face is their mother-in-law. What brides may not realize is that all they want to do is share in your joy. Many mother-in-laws to be do not know what the bride expects of them. They are caught between wanted to help and not wanting to be a bother. As a bride, you should try to find a way to include your mother-in-law, it will go along way in your relationship to come. I am not saying that they need to make every decision for you, what I am saying is that they would like to be included. We sometimes forget that this is the groom’s wedding too and if he is an only child, this is the only wedding his mother will be involved with. Try to make an effort to include her when you can. This can be as simple as going dress shopping with her. She will feel touched that you want to include her in this special time. Think of other ways that she can help, going to other vendor meetings or helping put together your programs or favors. I have seen brides fight with their soon to be mother-in-laws and it has put a strain on their relationship. If you can find a way to include her in your planning, you will find it will go along way in strengthening your relationship. Trust me, your new husband will appreciate it. While I think that you can do somethings yourself, you need to leave some items to the professionals. Photography is the big one. Your pictures are one of the only things that you will have after the wedding is over. Professionals know how to capture the moment and not your feet. Uncle Joe maybe a great guy who always takes good pictures of you opening up your christmas presents, but this does not mean that he can all of a sudden take pictures of your wedding. Even though better digital cameras are now available to the public, there is more to photography than just the camera. Lighting is huge and unless Uncle Joe carries with him the correct lighting, or really knows how to use the settings on his camera, your pictures will not come out right. Another place brides think that they can save money is with a DJ. An iPod is not a replacement for a DJ. Does your iPod come with lights and an MC? If so, let me know where you bought it. If not, then you will find that it will not replace a DJ. DJs perform many different roles. They announce you as you come in and all other events of the reception. They keep music going while you eat at the correct sound level. Finally, they keep the party going. They can customize the music according to the crowd. They may start with some classic songs while grandma and grandpa are there, and move to newer music when only the younger people are left. They can get the crowd up by playing the electric slide at the right moment (love it or hate it, it works at getting the crowd going). The question becomes, can your iPod do all of that? The answer is no. Brides also think that they can save money by having someone bake the cake. This is another mistake that brides make. Preparing a cake for 100-300 people is not an easy task and should not be taken at one. To properly prepare a tiered cake, you need to have many skills. Aunt Mary may make a good cake on your birthday, but can she really make cake for 200 people. Are you ok with the icing sliding down the side? If she attempts to make tiers, are you ok with them sagging and falling over? Probably not. You can normally find cake decorators in any budget, so do your research to find someone who is right for you. To conclude this series, it is important to understand that there are things you can do and things you cannot. Be smart about what you try to do yourself. You want your wedding day to be perfect, and so do we. 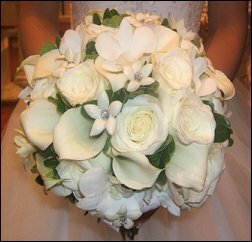 We hate to hear about a bride that tried to do things for her own wedding that she was not capable of because we are normally hearing that it did not go well at all. Most importantly, you are to be enjoying your wedding and engagement. Do not ruin either of these by adding undue stress with too many DIY projects. Hire professionals where appropriate and do not be afraid to ask for help. Wedding planners are here to help when the stress of doing it yourself is too much. While you can easily do somethings for your wedding by yourself, other items may need to be left to the professional. Maybe you think that you can create your own centerpieces. This is ok, if you can do it. If you are not very creative and just throw something on the table, it will show. People will notice if the fake flowers are just stuck in a vase. I am not saying that you cannot do your own centerpieces, I am saying that you need to know your limits. If you are a very creative person that can look at a picture and recreate something, than great do your own centerpieces. My sister happens to not be creative (she is the first to tell you), and would have made horrible centerpieces if she did them by herself. She knew for her wedding that she could not create them, so she had me do them. 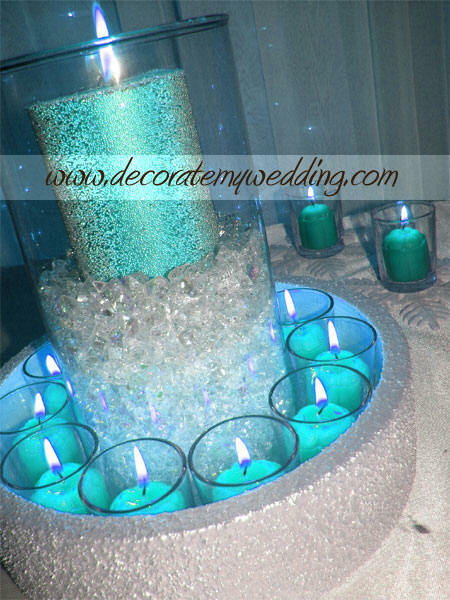 Some centerpiece ideas are easy to recreate because you can purchase items already completed and just set on tables. Other centerpieces take time, effort and skill to create. If you see a picture from a celebrities wedding that you just have to have, be aware that they did not do it themself and hired someone. If you try to duplicate it yourself, be prepared that it will not look the same. If you are ok with that, great. If not, then hire a florist or wedding planner. This does not end with just centerpieces, but you get the idea. Know what you can and cannot do, and it will go a long way in preventing unneeded stress.